At Spring Acre, we offer breakfast to all our guests with our compliments. Sri Lankan breakfast or Traditional English breakfast will be served. You have a host of options for your lunch and dinner at Spring Acre. Speak to us and we will arrange one or more from a combination of the following options so that you have the flexibility to enjoy Nuwara Eliya and its surroundings, while staying at Spring Acre. Option 1: The restaurant, which serves a variety of Sri Lankan and Western cuisine, is just 3 minutes walking distance from Spring Acre. You could order your meals and we would be happy to serve it at Spring Acre. Alternatively, you may choose to have your meals at the restaurant. Menus can be provided on request. If you possess culinary skills, you are most welcome to use the self-cooking facilities in the well appointed pantry at Spring Acre. The ingredients can be purchased from the supermarket in Nuwara Eliya, which is 10 minutes drive from Spring Acre. Option 3: Alternatively, you can leave it to the experts to cook your lunch and dinner for a nominal charge. The ingredients can be purchased from the supermarket in Nuwara Eliya, which is 10 minutes drive from Spring Acre. 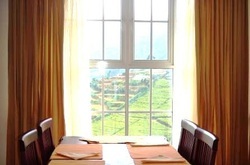 Option 4: Eat-out at a restaurant near the Nuwara Eliya City Centre, which is 10 minutes drive from Spring Acre. For a list of restaurants in Nuwara Eliya and contact information, please speak to the caretaker at Spring Acre or click here to download the list. Your holiday in Nuwara Eliya will not be complete without a joyful evening of sing-along to Karaoke, stroking the friendly BBQ fire at “Spring Acre” in “Little England” of Sri Lanka. The marinated meat items and ingredients can be purchased from the supermarket in Nuwara Eliya and the caretaker will be happy to assist you with the BBQ. The cook was one of the best that I had had preparing food for me and his barbeques were fabulous. Cook accompanied us to the shop, selected our ingredients & made us a delicious home cooked meal. Housekeeper was also lovely & a great help. thank you for making our stay in Nuwara Eliya so memorable.